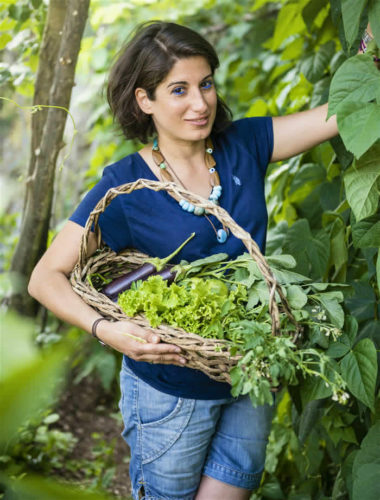 ‘I want you to try everything,’ says Elli Papageorgiou, emerging from the kitchen of her small café in the cobbled square of Kapesovo. She sets down a jug of sour cherry juice on a table heaving with food: cured sausage cut into rounds, fat green olives, garlic toasts heaped with tomatoes, and tiny cakes drenched in syrup. The jug lands with a clatter that startles a pack of sleeping dogs. ‘Besides, walkers need energy,’ she says. Philoxenia, meaning ‘love of a stranger’, isn’t just a word but a way of life in Greece – a deeply ingrained culture of hospitality that manifests, mostly simply, as an offering of food. Though the practice is perhaps a little strained in the popular islands, those who seek out the remote northern region of Zagorohoria tend to leave it as friends. For centuries footpaths were the sole routes connecting its 46 sandstone villages, and these ancient thoroughfares are still the most atmospheric way to get around. 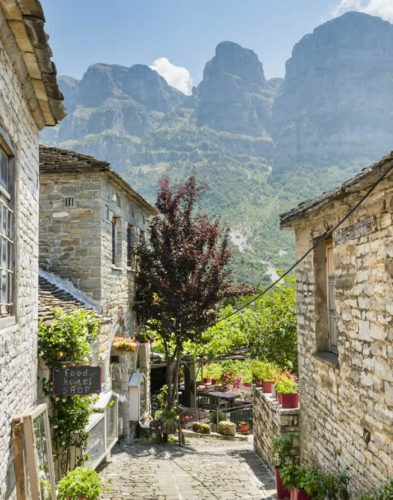 The area’s outstanding natural attraction, the Vikos Gorge – known as Greece’s Grand Canyon – can still only be explored on foot. 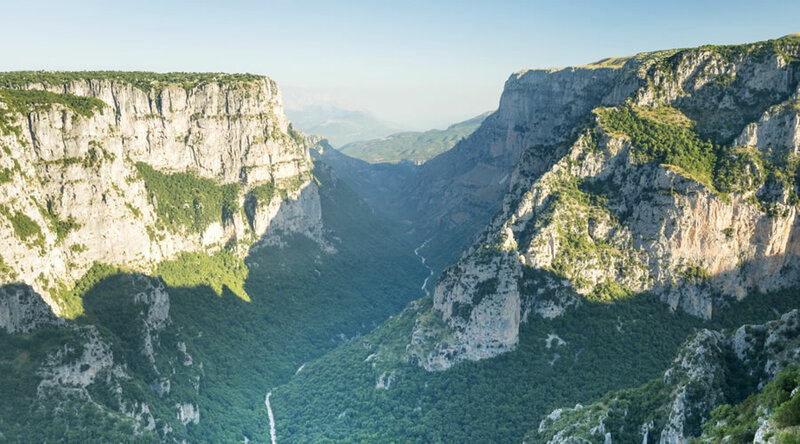 The world’s deepest canyon in proportion to its width, according to Guinness World Records, the Vikos Gorge is intimidatingly cavernous when viewed from afar, but strolling within it, it seems a sheltered idyll. Within minutes of leaving Monodendri, the path into it dips sharply, slipping under a dense arboreal canopy. Beards of moss hang from the branches of plane, oak and beech trees, and clusters of mushrooms bloom on long roots. Sprouting amid a carpet of bracken are Chinese money plants, their coin-like seedpods scattered along the path like a treasure trail. The riverbanks are a picture of luscious abundance, so springy with moss underfoot that I occasionally break into a gleeful, scampering run, but the riverbed remains dry. Limestone boulders usually submerged by water lie sun-baked and exposed. The walk alongside the empty waterway is so easy and flat that three hours pass by in a semi-trance. But suddenly there’s an unmistakable gurgle. Unlike the river with which it shares its name, the Voïdomatis spring never dries. Even in high summer, it’s icy. Two walkers – the first I have seen all day – cool their feet at one of the natural pools, but I cannot resist total submersion. Pond skaters shimmy across the surface, their long legs casting exaggerated shadows bigger than a bear’s paw. Half an hour later, the path out of the gorge winds uphill, occasionally crossing scree slopes that leak flinty stones back into the abyss. From above comes the whistling of a shepherd, his flock bleating unseen in the foothills of Mount Astraka. There are still herders here who belong to the Sarakatsani tribe. Said to be the original Greeks, its people are traditionally nomadic but some have settled in Zagorohoria’s villages. Tasos’s words ring in my ears as I set out on the trip’s biggest challenge: the 1000m ascent to the Mount Astraka refuge. Perched on a narrow ridge between two peaks of the Pindus Range, this takes walkers into proper mountain territory. The terrain is more open, the sun rising over swathes of dewy grass. But the climb has barely begun before streams of Lycra-clad superhumans steal my thunder. 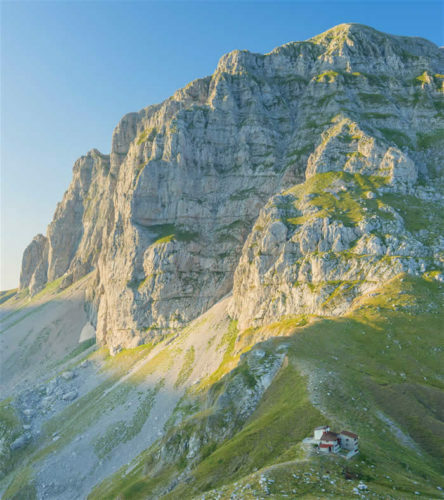 The runners are contestants in the longest of the annual Zagori Mountain races – a mighty 50 miles. Though Olympian both in appearance and focus, they are unfailingly polite, issuing a cheerful ‘Yassas!’ (Hello!) as they bound past at an intimidating pace. Other walkers linger at the springs that punctuate the path as it zigzags broadly uphill. As we refill water bottles at the tap, the atmosphere is convivial. Nurse Thanusis Zafeiropoulos, who, with his broad frame and ponytail, has the look of a minor Greek god, is here with his preteen son, Paniotis. ‘There are many people who have taken up running during the economic crisis,’ he says. ‘They run into the mountains to try to escape from the madness.’ He gestures down to the valley and laughs; the view, a sweep of green dotted with pretty stone villages, is one of unparalleled serenity. When I arrive at the refuge, a simple lunch is being served: soup, bread and omelettes. At the communal table all the talk is of where everyone will go next. Some will climb Gamila, at 2,497m the highest peak of the Tymfi massif, while others are heading to Drakolimni: Dragon Lake. It sounds like a quest’s end plucked from a storybook, and is reached via landscapes that are similarly fantastical – a vivid green plain where hikers have written their names in pebbles, a meadow filled with alpine wildflowers, a dark cloud of chirping birds swarming through an otherwise empty sky. Arriving at the lake over the crest of a hill, I find two ibex standing sentry and the water, true to its name, full of baby dragons. Or at least large alpine newts, peering out from the reedy shallows. I spend hours lolling on the grass and swimming with the dragons, but eventually a thunderclap announces the arrival of a storm. As the clouds roll in I find myself inside one of them, and make my way back to my bunk bed at the refuge as if wading through ghosts. ASTRA INN is this year’s Winner of Greek Hotel of the Year 2019!